Take A Self-guided Audio Tour! 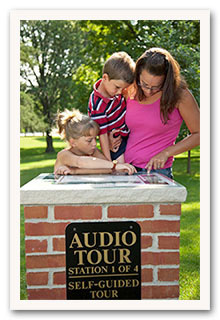 The Orphanage Museum welcomes you to tour the six outdoor audio stations located throughout the State School grounds. The first station is located just north of the flag pole plaza in front of the City Administration Building. Each station guides you to each historic site, such as Boys' Cottage 11, the Children's Cemetery, Root Cellar, Flag Pole Plaza, Rock Garden, and 1898 School Monument. Not only does this self-guided tour give the history of the State School, it also loops you though the grounds so you may take in the historic architecture and re-faced Root Cellar. Harvey Ronglien, who lived at this orphanage from 1932 to 1943, has recorded the audio tours will serve as your guide. Harvey "gives life" to the buildings and grounds by describing how they were used when this site was home to 10,635 Minnesota children between 1886 and 1945. Minnesota's only state-run orphanage (1886-1945) is today listed on the National Register of Historic Places and averages around 7,000 visitors annually. There is no charge for this tour, but you may choose to purchase a "walking tour guide" and map at Cottage 11 or the Owatonna Park and Recreation reception desk. We are grateful to the following whose funding made this audio walking tour a reality: The Women's Club of Owatonna, former State Schooler Kathleen Sherman, Insty-Prints, Viracon, and the City of Owatonna.The outdoor audio stations are operational May 1-November 1.